Pioneers in the industry, we offer petrol chain saw machines from India. Size/Dimension 18" , 22" and 24"
Chain saw machine is a mechanical saw that has a rotating chain attached to a set of teeth. 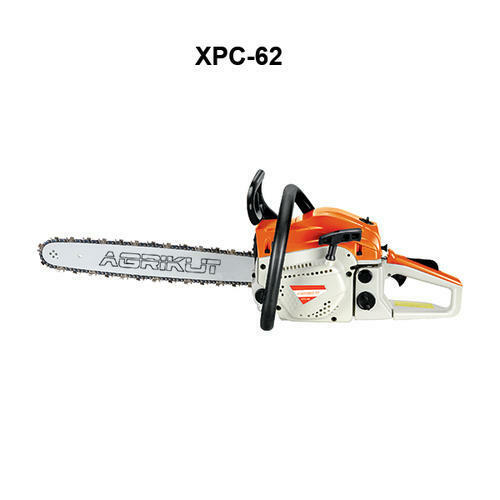 This is used in activities like felling, bucking, pruning, harvesting firewood etc. Special electric chain saws are used for cutting concrete. A chain saw can also be used for cutting ice i.e. for ice sculpture. We offers the best available chain saw price across various platforms. The chain saw consists of various parts: 1. Engine: it is mostly a two stroke gasoline internal combustion engine or an electric motor. 2. Drive mechanism: This is generally a centrifugal clutch and sprocket. 3. Guide bar: An elongated bar that guides the chain 4. Cutting chain: In this, each segment contains sharp cutting teeth.